Scientists have used an imaging technique to reconstruct the brain architecture and neural networks of the thylacine—better known as the Tasmanian tiger—an extinct carnivorous marsupial native to Tasmania. 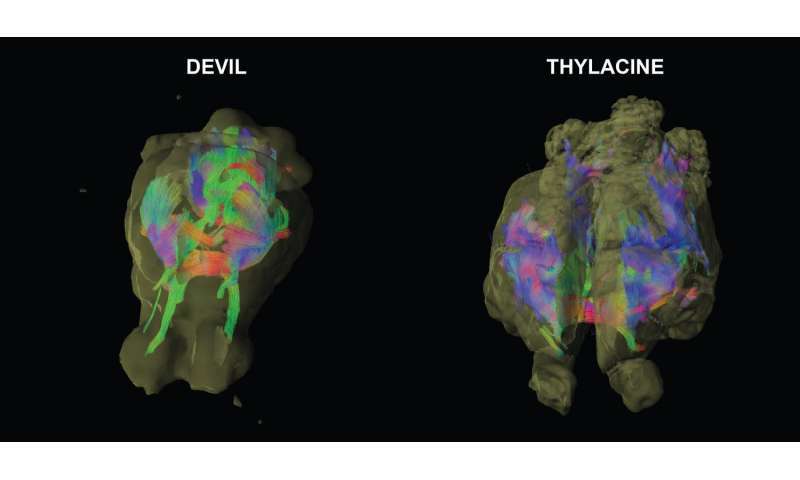 The study, published in PLOS ONE, used magnetic resonance imaging (MRI) and diffusion tensor imaging (DTI) to scan postmortem specimens of two thylacine brain specimens, both of which were about 100 years old. The results, when compared to the Tasmanian tiger's closest living relative, the Tasmanian devil, suggest that the larger-brained thylacine had more cortex devoted to planning and decision-making. "The natural behavior of the thylacine was never scientifically documented," says Gregory Berns, a neuroscientist at Emory University and the lead author of the study. "Our reconstruction of its white matter tracts, or neural wiring, between different regions of its brain is consistent with anecdotal evidence that the thylacine occupied a more complex, predatory ecological niche versus the scavenging niche of the Tasmanian devil." The comparative study also supports theories of brain evolution suggesting that as brains grow larger they become more modular, or divided into sections associated with discrete functions, Berns says. Kenneth Ashwell, an anatomist at the University of New South Wales School of Medical Sciences and an expert on the brain evolution of marsupials and monotremes, co-authored the study. "The technology for imaging the preserved brains of rare, extinct and endangered species is an exciting innovation in the study of brain evolution," Ashwell says. "It will allow us to track pathways and study functional connections that could never be analyzed through older experimental techniques." Monotremes, such as the egg-laying platypus, are remnants of the first mammals, going back more than 150 million years. Marsupials formed a later branch of mammals, including the best-known example, the kangaroo. Instead of laying eggs, they bear relatively undeveloped young that must be carried in a mother's pouch. The Tasmanian tiger looked like an amalgam of several animals. It is one of only a few marsupials to have a pouch in both sexes. It was the size and shape of a medium-to-large size dog, but had tiger-like stripes running down its lower back and an abdominal pouch. Its Greek name, Thylacinus cynocephalus, means "dog-headed pouched one." The fossil record shows that the Tasmanian tiger appeared about four million years ago in Australia. By the 20th century it was extinct, or extremely rare, on the mainland but was still found in Tasmania, the island state off Australia's southern coast. Its demise is attributed to loss of habitat through farming activity, coupled with a bounty scheme placed on the animal after it was suspected of killing sheep and other livestock. The last known Tasmanian tiger died in 1936, in Tasmania's Hobart Zoo. The Tasmanian devil, another iconic animal of Tasmania, is now the island's largest surviving carnivorous marsupial. It is known for its powerful jaws and scream-like vocalizations. Tasmanian devils are also unique because they suffer from devil facial tumor disease - an infectious, non-viral parasitic cancer which they can transmit to one another through fighting. While the unusual disease makes the animals of interest to cancer researchers, it is threatening the survival of the remaining Tasmanian devils, whose wild population has declined by 70 percent during the past 20 years. Berns, who was the first to conduct MRI experiments on awake, unrestrained dogs to learn more about their neural processes, was particularly intrigued by the thylacine due to its physical resemblance to dogs. "The thylacine appears to be an example of convergent evolution, filling a similar niche that members of the canid family did elsewhere," Berns says. "It's interesting, however, that the thylacine brain is very different than the canine brain, despite the physical resemblance of their bodies." Only four surviving specimens of the brains of Tasmanian tigers exist, and the study gained access to two of them. One was provided by the Smithsonian Institution, taken from a male Tasmanian tiger after it died at the National Zoological Park in 1905. The other specimen, loaned to the researchers by the Australian Museum in Sydney, came from an animal that died during the 1930s. The two Tasmanian devil brains used in the study included one from the Smithsonian Institution, which had been preserved around the same time as its Tasmanian tiger specimen. The other specimen came from a recently deceased animal and was supplied by the Save the Tasmanian Devil Program, a conservation initiative of the Australian and Tasmanian governments. MRI scans reveal information about the architecture of a brain—known as gray matter. Diffusion tensor imaging (DTI) provides information about how molecules move through biological tissues, revealing the connective pathways of a brain—known as white matter. The technique of using DTI on a non-living brain is mainly applied to research on recently deceased humans, primates and rats. Berns is pioneering the use of a special form of DTI to digitally reconstruct the neural networks of other animals, using archived brain specimens from zoological and museum collections. In 2015, Berns successfully used DTI on two decade-old specimens to map the sensory and motor systems of the brains of dolphins for the first time. The results showed how at least two areas of the dolphin brain are associated with the auditory system, unlike most mammals that primarily process sound in a single area. 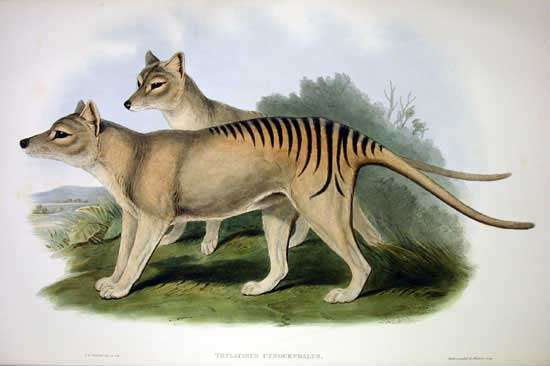 The current digital reconstruction of the brain of the Tasmanian tiger is particularly important, Berns says, not just because the animal is extinct but because the specimens used were much older than those of the dolphins. "While it is easier to study the brains of animals that have recently died, we've shown that we can successfully use our scanning techniques on specimens that are 100 years old," Berns says. "We now have the technology available to make use of the treasure trove of museum collections around the world." Berns launched a project called the Brain Ark , a digital archive of high-resolution, three-dimensional brain structures of megafauna, which is publicly accessible via the web so that other researchers can contribute to and draw from the data. It currently includes the scans from the dolphins, Tasmanian tigers and Tasmanian devils. The digital resource will allow researchers to explore questions about brain evolution, including how brain structure is related to species-specific attributes such as being primarily a predator or prey, foraging strategies, ecological niches and sexual dimorphisms. "We know a lot about the brains of primates and rats, but there are a lot of other animal brains out there that no one has looked at in any kind of detail," Berns says. "The Brain Ark is going to fill that gap. We are living in a time when much of the planet's megafauna is at risk for extinction. It's important to gather as much data as we can before many of these animals disappear."